Love your studio, Oma! Thanks so much for sharing all those pictures. One thing you didn't show us is how you store your thread. It doesn't look like it's in the storage under your machine. I would LOVE to have your rubber stamp shelves for my thread collection. Where do you keep yours? I'll have to see if I have a picture. The quilting thread is in pretty little boxes on the shelf behind the quilting machine. I don't keep a lot of it on hand because I don't quilt for anybody but myself and I like to use neutral colors or golds. So I only have about twenty or so spools (I think). I have a lot of embroidery thread and I keep it in special little containers made for holding those types of spools and those containers are on a shelf. My sewing thread is in plastic containers that came with my cabinet and fit in one of the drawers in my sewing cabinet. I really only use Aurafil thread for piecing. I keep several spools of neutral colors on a shelf in my sewing cabinet near the sewing machine. I try not to have a lot of thread stored anymore because I found that it really does get "old" and then it wants to act funky and break all the time. I was told to keep it in the freezer. I've decided to let the stores keep it until I want or need it then I'll go buy some. I do keep a back up supply of my favorite or most used ones. I found this pic, but it was before I put labels on all of the boxes, but you get the idea. This is the shelf behind the Liberty. Oh, it's WONDERFUL!! But, you obviously have no idea what a mess is. I see that you also have accumulated a large stock of toys with which to play. I'm so glad I have finally retired - I may get to use some of mine! Wow, Oma! It is so fun to see your space. I'm envious of your quality cabinets. I love your floor. And, I like the curved track lights, plus everthing else, of course. Thanks for sharing -- looks like you are a seriously creative person! I bought many of my toys while I was still working and I am enjoying them now for sure. You are definitely on the right track. Your time is coming. I haven't told you that I have a "computer/office" room that houses a bunch of my other toys. Ssshhhhh...it's a secret. LOL. The two Koala cabinets were by far the most expensive thing I purchased for my room in the remodel. I was a little stressed about the cost of them, however, having said that I have to add that they are the BEST, BEST, BEST thing I did. They are truly quality built. They have so much storage in them. I had these made taller so I could stand at either of them and use them as a cutting table. A sales person told me to get the taller cabinets because your neck and back don't bother you as much when you do a lot of sewing. I'm not sure I believed that at the time, but it seems to be true. I have a back and neck injury and I can adjust my chair in so many ways now to relieve some of that pain. I'm VERY happy with my cabinets. They are beautiful. WOW!! I thouht I had allot in my sewing room!! Whew, girl!! Next time DH says anything about how much I have, I'm going to show him your room!!! :P:P Looks wonderful!!! 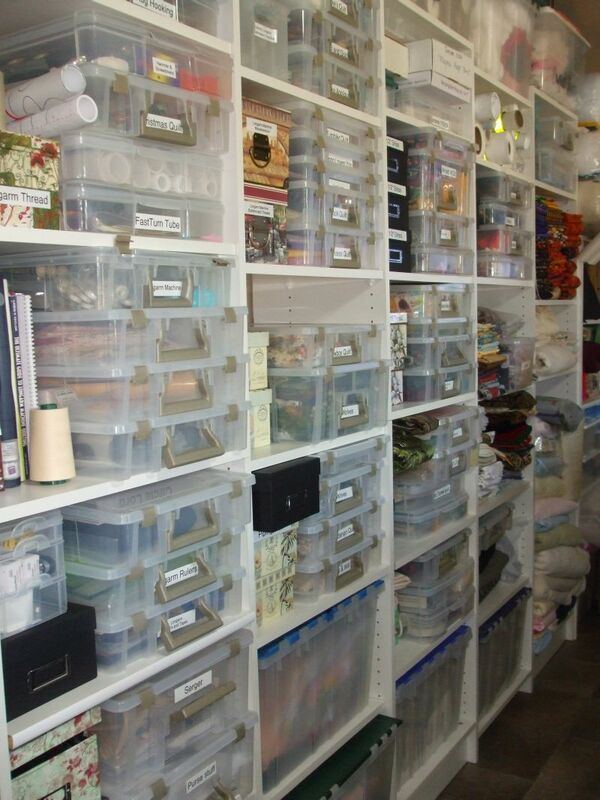 Nice room Oma and it sure looks like you have enough projects to keep you busy for some time! LOL I see you have Go! dies but you have the studio. Do you have both cutters or do you use your studio to use the Go! dies? 1. I wanted to do a "few" applique type things. Not badly enough to pay upwards of $100 for a die though. 2. The Studio dies are a lot more expensive than the GO dies and they should be because they are heavier and nicer. 3. I wanted to be able to cut at least 10 layers of fabric at a time...the GO just wasn't going to do that for me. It cuts 4-6 I think. Plus it was expensive ($399 at the time). 4. I bought the Studio, which I LOVE for the bulk of my cutting...all my strips and blocks, etc. 5. And when the GO BABY came out I bought it for under $100 then bought some GO applique dies cheaper and on sale online and using coupons at JoAnn's and other places. Therefore, the GO BABY and ALL my dies were cheaper than if I had purchased the GO without any dies or just a couple of the Studio dies. I also bought the adaptor for the Studio so I can use the GO dies or Sizzix dies, etc. if I need or want to. Oma, love your new space, you really can fit alot!! May I ask what you are using under your Liberty for storage? I will be soon in my new space, and there will not be alot of usable vertical space. So I am checking out everyone's fabulous sewing spaces for ideas!! The black ones are from JoAnn's (use the 40% or 50% coupon) and the white ones are from Target online (on sale). They were very "reasonable" that way...under $30 a piece I think and that's including the plastic trays. They came with wheels, but I didn't want them on wheels plus I don't think they fit with the wheels. I bought a few at a time until I had enough. They weren't always under my table. They use to sit on my shelves (with one shelf removed) and under my sewing tables. I actually had too many when I remodeled so I gave a couple away. The little girls across the street were ecstatic. Wonderful space..............you could hold up in there for years and not get bored..........haha Congratulations ! That room must be very large!!! !You have a lot of wonderful stuff!!!!! You'll be glad you did because it will save you so much time and effort. It made sense to me. The label on the dies seemed so small and it's only on one side...which always seemed to be the side not showing. Now I can see in a glance which one I want. If you look you will also see that some of them have a picture (like the triangle) and the size written. Just easier for me. Do you also outline your design on the foam and put placement markings? Very handy. And I will write on the foam part what size of fabric I need to cover that cut. Use a silver marker...it works so well. It's about 12' X 25'. It was suppose to be two bedrooms, but we left out the wall in between and one of the closets and made it a big bonus room so my quilting table would fit. 15 years ago I had a Juki with a 9" throat on a wooden 12' table. Thank you for your complement. It took a long time to get to this point, but it's been worth it. Thank you...I intend to try. LOL. As odd as this sounds...I have NEVER been bored a day in my life. My problem was always finding enough time to do all of the things I wanted to do. Thanks for sharing your studio. It is good to have a dedicated place for all your hobbies and room to play. You are one blessed lady. It is great to be able to visit your space. I am at the stage of deciding on the size of my cutting table and the best use of the space under neath. Thanks Oma for sharing. Great storage under your Liberty. How do you check the tension on the back of your quilt while on your Liberty? Well that makes perfect sense to me. I think I need to get the adapter and try a Go die. There are a few I'd like but like you not ones I'd use enough to justify the cost. I haven't used many of my studio dies but I haven't had time. My thinking is that I'd buy the dies now while I'm working and then when I retire I'll have what I want! Great studio! You seem very organized but not afraid to let your creativity flow through the space as you work. OMG!!! it is a shop......lol:) love all that fabric. I want a BIG studio, another AWESOME! !